We create opportunity for advanced learners! When our students master academic challenges, we help them reach even higher. The Paris School Enrichment Program provides advanced learners the opportunity to develop higher level thinking and in-depth problem solving beyond our rigorous curriculum. Students identified for this special pull-out programming are offered periodic enrichment activities tailored to their individual strengths. Paris School’s membership in the Southern Lakes Advanced Learners Network affords our Enrichment students the opportunity to qualify for exciting programming such as Southern Lakes Writing Anthology, Middle School Leadership, Science Immersion Day, Math 24 Tournaments, and Math Meet competitions. 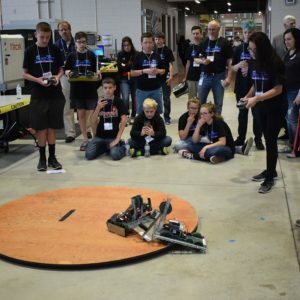 In addition, Paris School advanced learners travel to the Gateway Technical College Sumobot Competition every Spring. Our Paris School Enrichment Coordinators and middle school educators are proud to offer unique challenges for selected advanced learners throughout each school year!